Number Talks: 10-15 minute daily routine taking place during the beginning of lessons that focuses on the development of mental math. Number talks include student-student and student-educator discussions about solving a math problem mentally. These “talks” allow students to engage in discourse with each other, improve mental math strategies and fluency skills, and share with each other more than one strategy of solving a problem. 3-Act Tasks: Whole group student-centered mathematics activity consisting of three distinct parts: an engaging and perplexing Act One, an information and solution seeking Act Two, and a solution discussion and solution revealing Act Three. In order to complete a 3-Act Task, students must question, persevere, problem solve, and reason mathematically. 3-Act Tasks allow students to make sense of a problem in a variety of ways - Act 1 gives students an opportunity to generate questions and think critically about the picture or video they see, Act 2 adds to their thinking by providing a piece of information after they begin to ask for it through their noticings and wonderings, and Act 3 provides students with the solution. Math Sketches: Intended to support students in learning abstract mathematical concepts, math sketches are visual representations of how to determine the solution to a problem. This “move” provides students with an alternate entry point in tackling a math problem through the use of diagrams, drawings, charts, number lines, etc. Exploration: Student exploration in math gives young scholars the opportunity to make connections to concepts they already know, making way for critical thinking, questioning, and investigating. Teachers may encourage the use of different tools, such as manipulatives and technology, to solve problems. Rather than direct instruction, teachers serve as facilitators of discussion. After exploring concepts, students may come together as a whole or in small groups to discuss their findings. Productive Discourse: Discourse in the classroom not only allows students to concentrate on sense-making, reasoning of math concepts, and critiquing ideas of others, it also gives teachers the opportunity to reflect on student understanding. In an effort to align our school vision for increasing rigor and positive mindset in our math instruction with the District 25 goals, we have designed a structured professional learning series involving professional development workshops and inquiry work, which we kicked off with “Math Day” on Election Day last week. 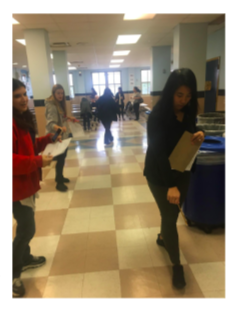 Math teachers trained in Algebra 4 All designed a series of tasks to engage teachers in this work while modeling how making real world connections and promoting productive struggle can both motivate and engage students. Teachers worked in predetermined partnerships to complete these tasks. Any partnership who completed 5 tasks in 2 hours was entered into a lottery… the prize? An extra prep period covered by their supervisor! Teachers were most definitely motivated. 3. Follow up professional learning to augment understanding of conceptual learning and introduce specific ways it could be integrated into math instruction. Presentation that engages teachers in understanding designing lessons to enhance problem solving and productive struggle to gain conceptual understanding in a variety of ways. Specific bridge to practice: the use of 3-Act Tasks to engage students. Teachers worked together specifically on this 3rd grade task. 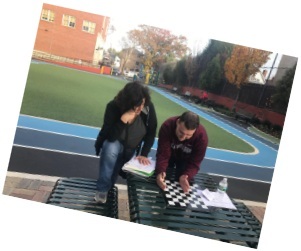 To demonstrate their understanding and their ability to apply their learning to practice, teachers were invited to work with their grade teams to complete “Extended Exit Tickets.” Teachers worked to modify a GoMath lesson to enhance conceptual understanding and problem solving. 1. Following this professional learning day, we will be engaging in a cycle of professional learning on Monday afternoons to support this work and to tie in to teachers’ cycle of inquiry around this work. This session helped me understand how to implement necessary shifts in my instruction to implement student, centered problem solving activities. I plan to incorporate some of the suggestions regarding how to approach math in an open ended way, where the children are allowed to think of more information in order to solve the problem. I will try my math lessons in this way. I plan on looking at the problem solving questions and making them more "real life" questions for the students. Not giving them all the information they need right away, but rather letting the students decide what they need to know to solve the problems. We have purchased access to Go Math! Academy™, a supplemental online resource for K-5th grade students to use for math practice at home. 2. Enter the provided Access Code and click “Redeem”. 3. Enter our school zip code (11355) and choose our school name (PS 120) from the School Name list. ** Contact the Main Office or Parent Coordinator (Ms. Zhao) if you don't have the Access Code. This code will give your child access to the program till 2/4/2020. ** Please keep this code private. Sharing will reduce the number of subscriptions available to our students. ** After setting up your account, you only need to click “Login” on the homepage to sign in every time you use the program.